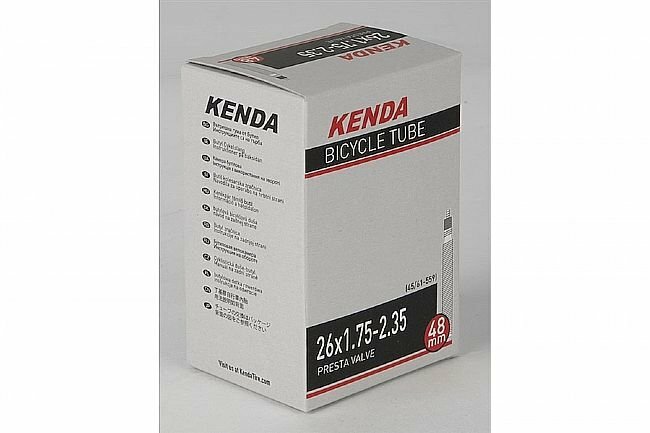 Kenda's Standard MTB Presta Valve Tube is an economical, standard thickness, butyl tube. This version fits 650b/27.5 Inch tires (584 ISO) and has 32mm Presta valves. Various widths. Note: 650B x 53/60 Presta (53/60-584) box reads 27.5x2.1/2.35 Inch. hey, it's a tube..it holds air and it's shape well enough. I don't get flats much except in August when the goatheads come out. I look forward to punctures. Kenda's do the job just fine. And, yeah, I'd recommend them and will probably buy more. Great price for an important specification! I went into a bike shop to get a backup inner tube for my new bike which has 650B tires. The store representative sold me 26 1.75 inner tubes saying they were the best size for my bike tire. This was a very bad idea. I discovered the mistake when I got a flat on a very rainy day. Through about 10 years of commuting I have found that most flats will occur in the rain. I think due to rubbish washing out into the road. I popped out the old inner tube and installed the new one. Tried to pump it up and ... oops, it would not inflate. Found that the tube had been gouged when installing. Used a patch kit and fixed the hole after pushing my bike to a covered area. Installed the patched 26 tube and again tried to pump it up. Same issue. Bought this inner tube size (the right one for a 650B tire) and installed with no issues. Bad store rep, bad store rep. No biscuit! Go lay down in your bed. BTW, I really like 650B tires for bike commuting. I also have a 700c which has some advantages. Use Kenda 650b tubes on my touring conversion bike. They are paired with lightweight 38c Panaracer Pacenti gravel tires. The last thing I want is a flat when I am touring. This tube is thick enough to to help ward off those tiny slivers of glass and wire that work their way through the tire casing without completely failing so the worst you get is a slow pin prick leak. The valve stems are short but work fine with Velocity Synergy rims. No splitting or pinch flats to date. Good value. I'm currently using these tubes on a recent 650b conversion. They are in a pair of used National Tire Company, (same as Nifty Swifty) 33mm wide touring tires. For overkill I have slime tire liners. Been running them around town 50 to 70psi, no problems. Am looking forward to touring/camping this summer with this setup. Gave them 5 stars for my use. Maybe lighter ones for speed oriented applications. Been using it for a few months now, approx twice a week. Mostly up and down single tracks. So far so good. Would recommend this product, especially when it's on sale.